A special Thank You to Harper Collins UK for sending me this book to review. Laurel faces the fight of her life to save everything , and everyone, she loves. An extraordinary faerie tale of magic and mystery, romance and danger. This is the finale folks! I've been following this series for over 3 yrs. I had very specific ideas about the ending of this tale and I wanted what I wanted! Laurel, don't let me down gurl. I can't handle it. 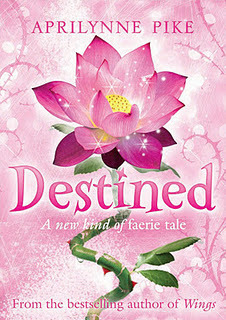 Destined takes place immediately after Wild (Illusions in the USA). We're taken back to that last scene and that is where the action starts and it doesn't stop the whole book long. There is a lot going on here. We even have a death of a central character early on. My heart was a little hollow after that. This is till middle grade/YA so it isn't graphic but this tale is basically genocide of the fae race. When would the dying end?! Would all be lost? Now, for what you've all been reading for. Does she choose Tamani or David? Well, I can't tell you. My Mom asked me this, "Was the ending satisfactory?" Yes it is. I'm happy with it. But, there is a tiny epilogue of sorts. An ending from the person not chosen. It is sad. Well, more like bittersweet. My heart broke just a little bit. For a fantasy, this last letter was probably the most realistic thing of the 4 books. That truly is what happens when you're not chosen. You want to forget so the pain will stop. I'm sad just thinking about it. Great ending to such a fantastic faery series! I can't wait for my nieces to get just a little bit older so I can share this with them. I've truly loved this series and I'm sad to see it end. I was looking over my books last night and this series is well worn. I've read them many times over. They have brought true joy. They are really fun. Team Tamani forever! Farewell Avalon, I know you'll be waiting when I want to return. "Screw it," Chelsea muttered under her breath. "I am not going to die today without doing this. Wait!" I've read them all apart from this one..Pleeaassee choose Tamani Laurel!! !